In the late 50s and early 60s, corporal punishment at Fawcett School was commonplace. Many of the teachers used ‘the strap’. This was a long piece of leather, with the end cut into strips, presumably for maximum effect. An offending student was called to the front, told to put his hand out and given a huge swipe of this awful instrument. If the hand moved, the student was given another swipe. Imagine having designed such a piece of equipment. Other teachers used canes, which were usually used by giving the offender a number of whips against the back of the trousers. One teacher used a plimsole. The student had to bend down, while the teacher would walk to the far end of the classroom and run as fast as he could, giving the student a terrible whack across the behind. Some students fell over. One much younger teacher broke rulers over students’ hands; another slapped boys across the head with an awful strength. A feature I never understood in a school, was the continuous stream of sarcasm from many of the teachers. Examples were quoting Shakespeare at us by repeating ‘you rocks, you stones, you worse than senseless things‘; or asking ‘so you are the cream? I hate to think what the milk is like’. This was a reference to our being in the top stream of the school. The statement didn’t worry too many students as it was such a weak suggestion, but plenty of barbed comments really did dent confidence. I seem to remember that only three of the teachers ever said ‘well done!’ to anyone. I also suspect that none of those three would ever have considered corporal punishment. They were probably the only three who had a sense of humour. I cannot imagine that any of the above punishments were anything to do with education. I do not think the sarcasm gave anyone an ounce of self esteem. Those of us who did quite well after leaving the school did so, I believe, in spite of Fawcett, not because of it. Good old days? I do not think so. Do you have experiences to share? Please post below – and please – do not name specific individuals. It would appear that this writer had a very sad time at Fawcett school and I wonder how much punishment he actually received in order to arrive at his conclusions. I attended Fawcett in the late ’50s and while I was, on rare occasion, the recipient of the strap, and the slipper from my form master, it was usually for good reason and has had no lasting effect. While not an academic at the time I did learn respect and good manners, something sorely missing today. Judging from the other writers and articles regarding their time at Fawcett it was not that harsh and I know many of the other boys who went on to much better things and successful futures, as did I.
I think that by reading your comments that you must have been one of the exceptions? I attended Fawcett School from 1954/56,and, yes, there was a strict code of discipline but only after I had been given fair warning. My Teacher for Class 2c, who must remain nameless, gave us fair warning that 2c was the best class in the school and if we wanted to be treated like Adults then we had to act like Adults. We were used to discipline at home so discipline at school was something we accepted. When the sudden move to London came and I finished my education at a London School I was all of a sudden the golden boy as the teachers were way behind the teachers I had at Fawcett School and thanks to my early secondary education at Fawcett School I was now one of the brighter boys. So I have have something to thank Fawcett School for. My recently deceased husband attended Fawcett School from about 1960-63, and he was sure that it was mostly run by brain damaged psychopaths. He spent his whole school life fearful of these men, and probably never achieved the academic results that he was capable of, and the knowledge and learning he gained after leaving that “hell hole”. All the comments that Philip said above are absolutely true, and as a Margaret Hardy girl, and married for 46 years, I never stopped hearing about his hate for that so called school. Both of our grown up kids, are high school teachers in Australia, and although the school kids can be very difficult at times, the thought of inflicting pain on them would be inconceivable and illegal thank goodness. Margaret Hardy didn’t take that approach with us girls, so most of us probably grew up to be quite normal women, hopefully. I was also a pupil at Fawcett School in the late 50s/early 60s and my experience of getting the strap was an occasion when the class handed in their exercise books for marking. Later the books were returned with the master’s marks or comments. On mine it simply said “See Me”. No other comment or clue was given. In front of the class I approached the master and showed him my book with his comment. He simply told me to hold out my hand and, without any explanation or reason, strapped it. I was then told to return to my desk with nothing further said. To this day I have no idea why I was punished and, as a result, my sense of injustice is still there after all these years. What on earth could such a punishment possible achieve when the recipient was not even told what the alleged offence was? In those days, of course, a pupil would not have dared to question a master about his actions which why I could not ask him. My memory of some of the teachers is of bad tempered, irritable men who felt the need to inflict physical punishments as a first resort rather than a last, whilst others managed to control their classes without such violence. Reading through the many comments on this site about the old Fawcett it seems that one group are very positive about their time there whilst others only have negative memories. Like the contributor of these latest comments I also fall into the latter category and concur that any success I achieved later in life was in spite of, rather than because of, Fawcett. No, not good old days for me, either. I was a pupil at Fawcett from 1954 to 1959 in the grammar stream. I recognise all of the behaviour patterns of some of the teachers as mentioned by some of the other contributors to this site and then some. It is absolutely clear that had they done some of the things now, that they had done then, they at least would have lost their jobs and in some cases gone to prison on charges of assault. Exaggerated, I think not. I saw, when I was 11 years old, a boy slapped around the face with a punishment called “a double two timer”. That meant he was hit twice with two hands simultaneously then two slaps to each cheek. After that the marks stayed the rest of the day, like a warning badge reminding other pupils of this punishment. This boy’s crime was he handed in a badly written essay.This same teacher carried two straps in his brief case, one V1 and the other V2, named after the German terror weapons from the Second World War. He used V1 for lesser offences and the V2 for greater crimes. My own experience of the frequency of corporal punishment was that it started almost immediately. I was strapped, caned or slippered and had a chair thrown at me as I was just going out the classroom door to get the strap from the staff room. My crime was looking at the teacher and not my book. This is quite heavy stuff for 11 year olds to be confronted with. What it did was to galvanise the pupils’ role in this polarised situation in their part of “them and us.” With the brutal teachers, we tried to keep our heads down. Some of the other teachers we came to respect. We never respected the brutal ones. Respect is earned and can never be demanded. The second year, (1955) was the worst year as far as the punishment was concerned. We obviously were not learning our places quickly enough. Pupils were being strapped, caned, slippered or slapped on a daily basis. In the third year (1956) the incidence of punishment declined to virtually die out in the fourth year(1957). 1958-1959 was free from corporal punishment but still a few detentions took Place. All these incidents are part of my experience as a school boy. How it was in other classes I don’t know. We heard rumours but others must come forward with that information. Those events created an enormous solidarity in the class which obviously helped with our perspective in the situation. A few of the teachers were fantastic, quite a few were ordinary and some were animals. Strangely enough they were the good old days for me, but that was more to do with my class mates. I was at Fawcett 1950/1954, it must have been the worst school in the country for violence to pupils. About 1952 I remember a teacher hitting me round the back of my head for borrowing a rubber from the boy behind me. I picked up my stuff and went home. My father knew a local councillor and he put a complaint in about the teacher. I believe he was suspended for several weeks. Not one good memory at all. Reading some of these comments has brought tears to my eyes. Anyone who still believes that this form of brutality does some good, needs to think again. Best wishes to the gentlemen above. There are, at least, two awful things here. First, that this child abuse took place at all. Second, that we had no idea how children in other schools were treated. We assumed that the treatment was ‘normal’. I was at Fawcett school from 1961-66 and I now rationalise it as a period of control not learning. The beatings appeared to be a sport in which I was fairly central, most days I was slippered or strapped but I never new why. Towards the end of one year I was asked by the teacher how many times I had had the slipper during the year, I replied about 97 times, he called me out to the front of the class and said lets make it 100. I watched fights between staff and pupils that were allowed to continue while the staff cleared the hall. One teacher used a leather strap with lead strips bound into the tails of his strap. I was called out to the front of the class and strapped on both upturned hands. I could not use my hands for hours afterwards. I also remember being set a geometry problem and taking the answer to the teacher who said that is the correct answer but you worked it out the wrong way. I was also challenged as a cheat for drawing a map of Great Britain free hand. I had to draw it again during class which I did, but there was no apology or recognition that I could do it. When Fawcett joined with Patcham (high school?) we were asked to design a badge. I designed one with castellated joins between the Fawcett and Patcham badges and showed it to our art master. He then presented it as his idea. It was a really damaging environment for children to be confined in. There was a ‘ritual’ which all staff were aware of which was the movement of children from the second year to the third which involved moving to a different tarmac playground. Part of the humiliation was to throw the younger children into a stair well and spit etc on them. During the year I was involved (64?) one child was taken away in an ambulance near death and I ran out of the school grounds. I think this may have been the start of my attitude ! I was brought before the head master for leaving the school grounds which I countered with I did not want to be taken out in an ambulance. It was not really a school more an institution. I have read the comments on the punishment that was dished out, did it hurt us, did it heck. We were used to discipline at home and if we got slippered or strapped it was for a good reason. All of the teachers had names for their instruments of torture, such as Horace Henry, The Mighty Atom, My Size 9 Slipper, The Wacker, The Order of the Wallop. I could go on for hours but then it would get boring, happy days. Seems to me like you lads should toughen up – whinging about getting hit/thrashed/caned. It was the norm then and society has moved on. The law now says I can’t smack my children – I don’t agree with it but that is the law and I have no say. As such, my child back-chats me in a way I would never have dreamed of to my parents or teachers. Whilst brutal, it taught discipline and your place in society. Well said Steve Gallagher, at last someone is reading from the same page as me. Thanks to the P/C Brigade discipline has gone out of the window. The local Bobby was also the man we respected – if we got caught misbehaving it was a thick ear and the threat of telling our parents which was even worse. It says nothing good about a school when schooling teaches you to ‘[know] your place in society’. Fawcett probably did try to do that. Fortunately many survived the beatings and went on to be critical, humane and questioning human beings. Others I guess still ‘know their place’. I can remember the moment when I knew something was wrong with the philosophy of education at Fawcett. I started a sentence with, ‘I thought…’ and the teacher told me ‘You are not here to think, boy.’ The policy seemed to be ‘accept the beatings, don’t question, don’t think’. For me, that doesn’t add up to much of an education. I attended Brighton Fawcett from 1945 when it was known as Brighton intermediate school and it’s true we did get the strap but the worst part was being told to fetch it and stand in the corridor and wait for the punishment. You can imagine the comments from the other pupils. I attended this school for thugs from 56-58. I entered the grammar stream full of hope and loved music and French, but within two years of standing up to teachers who were thugs I was strapped daily and became a thug and slipped down to class 2b and had I stayed would have been expelled. Luckily we moved to Crawley new town, and a couple of careers later aged 55 I gained an MA at Reading in 2001. Ironically the seeds of learning were sown at this awful place in Brighton, but of course they didn’t actually flourish or grow till I found a calm, mature, sensible place of learning and was taught by dedicated mature adults instead of crazed ex service teachers. A special hello to all my classmates who suffered the same. I hope that your lives turned out well despite such difficult and undeserved beginnings. I was in the grammar stream at Fawcett for two years in the 1950s and certainly not prepared for life at the school when I went there as an 11+ pass, a status not appreciated by some! 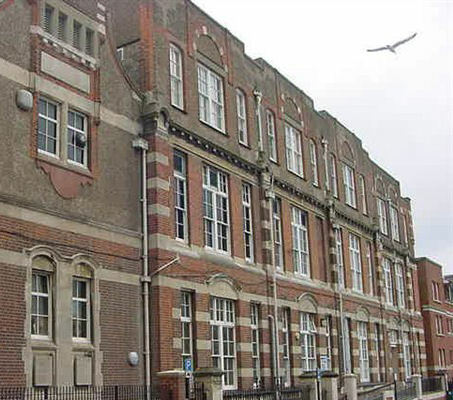 It should be realised that this was an inner city school which competed with the Building School across the Level for the status of toughest school in Brighton. Whilst there were some pretty tough teachers, and pretty tough pupils (one shot the other’s eye out with an air pistol, although not on the school grounds as I recall) I don’t recall the levels of punishment described although there certainly was consistent strapping which nowadays would be taken to be common assault. My class had a strap league with boys competing with each other for the most strappings in the term. Described now all this seems absolutely unacceptable behaviour, even unbelievable, but we survived somehow and thankfully it is a distant memory. I would, looking back, probably describe the experience as character forming rather than damaging. The majority of the teachers were dedicated and decent so we should remember that. Fawcett Geometry (as taught to me)I, too, was a completely innocent victim of the strap, after having fallen foul of the form-master’s dictum that ‘the shortest distance between two points is a straight line’. He went on to explain that in reality it was a theoretical line only and that, as such, it couldn’t be seen; it was necessary, therefore, to draw the line as thinly as possible. As the master – notice that they were ‘masters’ then! – began to move furtively around the classroom checking the work of each individual, I suddenly became aware of his intimidating bodily presence which cast a dark shadow over my desk. Before I knew it I was hauled in front of the entire class and given a good thrashing with his leather beast – supposedly for drawing an invisible line too thickly. That memory of Form 1a has stayed with me all my life; it’s not as though I could have back-chatted, ‘But Sir, I’ve drawn the line so thinly that you’re unable to see it!’, as that would have invited more punishment on the grounds of insubordination – I was truly damned if I did and damned if I didn’t. After checking that they were still all there, my delicate piano-playing fingers started to smart and sting for the next ten minutes and the best my fine motor skills could manage was jagged lines for the rest of the lesson.Has anyone out there any idea how to draw an invisible line? Answers on a postcard, please. I too attended in the 50s and I recall being completely uninspired by the whole experience. I walked out of 3G aged 15 and never returned and it was only later when I pursued further education at college with inspiring lecturers that I appreciated what real teaching should or could have been and how I’d been short changed. Academic standards were not good and looking back I can recognise an absence of genuine interest with most of the staff. It was a poor educational environment. To be fair Fawcett was an “inner city” school and probably did not attract too many career professionals. What I perhaps did learn however was a firm grounding in “streetwise” which has carried me through to a reasonably successful career and ensured that my children did not suffer a similar fate. It was a tough school but I had nothing with which to compare it at the time. I guess that’s life. There are two things that I don’t think have been mentioned about Fawcett. One is the air of tension that was always present. You knew that your time for the strap might only be minutes away. Second was the fact that we experienced brutality vicariously. We had to sit and watch as classmates were beaten. That, of itself, was an awful thing to experience. You can’t beat a child into an education and nor can you inspire them by making them watch assault. I attended Fawcett from 1956 and because of 11 plus results was in the lowest grade – I think this was 1E. The next year for some reason I went up the scale finishing in 5A along with my friend Derek Schofield. I remember some of the strapping and throwing of blackboard dusters. For me, it was directed against pupils doing something wrong so I never got strapped more than once! I found most of the teachers fine and particularly Jazz Bolton and Mr Polley the art teacher – they gave me great encouragement to do better. I enjoyed my time there and met up with many former pupils as we started our careers. I think for me it inspired me to work harder and eventually I went to Brighton College of Technology (part-time day release) and got my ONC and HNC qualifications that got me to become a Chartered Engineer. No regrets at all for the experience at Fawcett! Class 1A photographed in 1951?